Termites Also work unnoticed and uncontrolled because the common subterranean termites attack a structure directly from their already hidden colonies in the soil. They find their way into an unprotected home in a variety of ways. Concrete seems impenetrable, but in fact as a concrete foundation and piers age they develop cracks that termites can easily crawl through. Termites can crawl through a tiny crack in cement as small as 1/64 of an inch wide, directly into wood-all well hidden from view!. In addition to cracks, concrete has other hidden "termite highways". Holes for electrical conduits and plumbing, as well as expansion joints, are often used by these pests to enter a structure. Even porches made of concrete often have a dirt fill underneath that piles soil right up to various cracks and openings. Termites can travel through such cracks directly to structural wood, completely hidden from view. Because termites use these and other hidden avenues to enter a structure, they often stay hidden for years while they are causing damage. Our professional termite services are a wise investment that can help detect and control termites and other wood-destroying pests, protecting your property from extensive damage. With this summer's July 3 release of The Amazing Spider Man movie, we may once again have blockbuster summer spider movie, following after previous Spider Man and Arachnophobia movies that have been such big hits. This is just in time for spider season, as these pests once again start becoming more abundant in late spring and summer. Spiders are common pests that are not insects, but closely related. All spiders produce silk, but only some use their silk to build the intricate orb webs that we associate with spiders. Others, such as black widow spiders, spin a disorderly tangle of webbing. Other species build "sheet" webs or "funnel-shaped" webs. Still others, like tarantulas, actively crawl around and hunt prey. These spiders don't build webs to trap prey; they use their silk to cover their eggs, line burrows in the ground, or wrap their prey. Few creatures are feared as much as spiders. We have over 3,500 species in the U.S., but only about 50 can penetrate our skin, and the venom of most of these is too weak to affect most people. 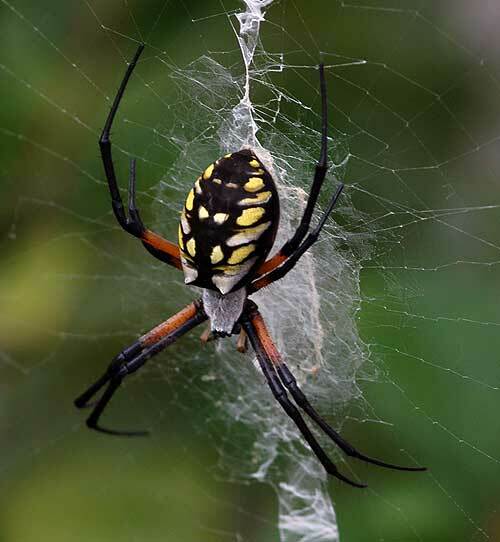 The spiders that have the nastiest bites are the black widow spider (and the spreading brown widow spider), brown recluse, hobo, and yellow sac spiders. Our regular professional service for spiders help prevent bites from both poisonous and nonpoisonous species. It also saves you the trouble of having to clean webs, spider droppings, and the dead insect carcasses spiders leave behind. The Florida Keys is battling an infestation of Gambian Giant Pouched Rats. The six-to-nine pound, cat-sized rats first appeared on Grassy Key over 12 years ago after a local exotic pets breeder let some escape. Officials have been trying to eliminate them for years by baiting and trapping, but the giant rats have multiplied and proven themselves a difficult and resilient pest. Each female produces 30 young per year. The concern is that if they make it to the mainland, they will damage crops and will likely harm native animals. These rats also can carry monkeypox and other disease. Did you know that as recently as 1935, before widespread mosquito control, 4,000 Americans died every year from malaria? In fact, modern, professional pest control has improved the quality of our lives in many ways. Because of it, many insect-transmitted diseases have been greatly reduced in this country. We live longer, healthier lives, without fear of sometimes deadly disease like malaria, yellow fever, and louse-borne typhus. Yet there are other pest-transmitted diseases that we have to watch for vigilantly. Tick borne diseases including Lyme disease are flourishing, and there are deadly pest-transmitted diseases like hantavirus, encephalitis, and plague, plus those that cause common everyday illnesses, like food poisoning. Of course bed bugs, which people previously knew only through nursery rhymes, have come back with a vengeance. These nasty blood-suckers over the last decade have become more and more common. Cockroaches can cause asthma, and rats bite 45,000 people annually--mostly children and babies. Stinging and biting pests like fleas, ticks, wasp, and spiders would inflict harm on even more people and pets if it weren't for professional pest control. Professional pest control also enables us to better protect our homes and property from pests. Termites, carpenter ants, and other wood-destroyers left uncontrolled can severely damage a building. And other pests damage or spoil stored foods, fabrics, and many other important household items. These are just some of the many ways professional pest control greatly improves the quality of our daily lives. It is well understood that the quantity of acorns produced by oak trees is a very good indicator of the size of mouse populations. The fall of 2010 in the Northeast set a record high for acorn production, at an amazing average of 250 pounds of acorn per tree. But the fall of 2011 was the opposite, with an average of less than half a pound of acorns produced per tree. This is tiny compared to the 25 to 30 pounds produced per tree in an average year. Tiger Wood's ex wife had her $12 million mansion completely demolished because of extensive termite and carpenter ant infestations throughout the foundation. She plans on rebuilding a new home in the same spot, very similar to the original home. This just goes to show how expensive untreated pest problems can come! Don't let this happen to you! Regular inspections and preventative treatments save you time and money. Call now for a FREE inspection.